My Life Journey: 7 years on the 7th! 7 years on the 7th! I couldn't resist making a cute little card for hubby for our Anniversary on Monday. 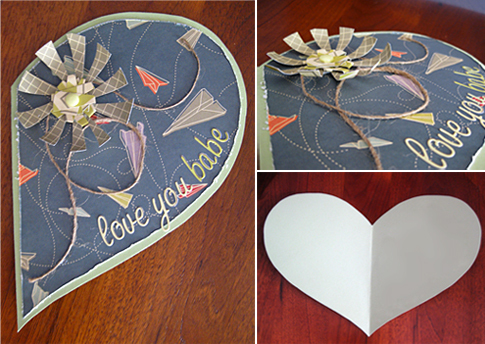 I've entered it at the Show us your stuff blog for their February Challenge to make something with a handmade heart. I hand cut the heart shape as the base and then added some string and a cool flower I just made up in the moment! Love how it opens to a full heart. Even hubby noticed. Hey Sis, it is totally gorgeous and so good to see you playing with paper and glue hey!!! Love the colours you chose and the addition of the string...Glad Al loved it...makes it all worthwhile hey!!! now thats just way too COOL, what a fab idea, thanks for playing along this month at SUYS! What an awesome card Leah.